upon arriving at the bay doors, all were full so i sat and waited until one was open. once in the bay, the staff was super friendly & welcoming, even though they had already been having a long day, they had a great attitude. Thorough. Showed me how to take plate off. Have used this location many times and never had a problem. I even had to get air in my tire and they had done that. Very nice staff. Very professional staff,well organized and friendly. very helpful with my questions. Worked as a team, appeared very confident in what they were doing. At the location in mt. Pocono I always use. The staff were friendly and fast . My turn signals, headlights and back up lights were not checked. I was not informed about a noted oil leak until I read my receipt in my email. Was this way they replaced my drain plug or is it a different leak? Would have been nice to have been informed that I needed other repairs. The shout outs of procedures done makes me chuckle because every visit something is missed. See above. It seems to me that if you refused the recommended additional service the rest is done half assed. I continue to miss Jiffy Lube. At Jiffy Lube you don’t have to sit in your car and your car was vacuumed while you were waiting for service to be completed. The cost of an oil change is about the norm for the area. Bulbs and other items including antifreeze and other fluids is very high. The only redeeming quality of Volvoline is that it is quick. Probably because it is done half assed unless you buy expensive add on’s. $100 for fuel injector cleaner? :-) Have a Nice Day! iN AND OUT IN A BRIEF TIME. EFFICIENT TEAM OF WORKERS. WAS ABLE TO SIT IN CAR. I was satisfied because of there was no wait time and great customer services. I was just a little displeased with the high cost of the oil change. It’s the highest I ever paid for an oil change. Aaron was very professional and didn't try to pressure us into getting anything unnecessary. He was nice and did fast and efficient work. Fast service and quality maintenance checks were performed. Even with my coupon for $8 off the cost was much higher than going to a full service garage. I normally pay $60 + tax for synthetic oil change. The final cost after my coupon was over $80. I would only use this for convenience when I cannot get into a more affordable shop in a timely manner. The manager and his assistant displayed a trustworthiness that you don't often see. I applaud these Valvoline employees for the honesty and integrity. This was actually my first time. I was a little hesitant at first but I’m truly delighted that I tried this place. I couldn’t believe for one.... I had stayed in the car the whole time it was being serviced. But the best thing was how fast they were. Yes Yes I was in and out. Friendly polite staff. I will be back again. Thanks. It was quick. My rep was very friendly and informative on what I need to do for my 150k checkup. Very professional and got me out the door. I was on a break from work. Oil change was complete in 20 minutes. I would definitely return in future. I prefer services to be quick and efficient. I was quite surprised on how well everything went since this was my first time at this location. So pleased that I came back with my other car on the same day. Quick oil change is all I needed and that's what I got. Every thing was just fine. They look at other things and let you know if something is wrong or needs to be fixed. No wait to pull in, technicians were extremely fast, professional and friendly. As a parent of a special needs child, it is very stressful and difficult to make/keep an appointment or wait in a waiting room. This service eliminates those concerns completely and saved me so much time. Will definitely return. Thank you for this incredible service and thanks to the technicians for a great experience. I was highly satisfied with the experience and knowledge of the service guy that was dealing with me.. I had no problem with the service. I'm a regular customer at this location. I have always received outstanding service. It truly did only take ten minutes for the oil change. The people who work there are very professional and efficient. Good shop. I’ll go back. Miguel’s assistant was above and beyond. Very knowledgeable of everything he went over. I didn’t fell pressured. His customer service was extremely appreciated. Quick and easy service. Purchased a groupon for the service but it didn't state that there will be additional charges. No wait, prompt service, great staff, good check of my car filters and other things! Great Service! The Service manager Brian was very helpful and courteous. I was very impressed with his professionalism and the speedy work that was performed. This has been my fourth visit and I will continue to bring my vehicles to be serviced here! No waiting. Enen without appointments. Energetic technicians. Quick efficient service. Added services completed seamlessly. Very courteous staff. workers are very pleasant and explain everything. High price. Paid for synthetic oil change with 7500 mile life. Windshield sticker said next oil change due 3000 miles. ???? They got me in right away...pulled up my info...showed me what they were doing and explained about recommended future work to be done...they were knowledgeable in what they were doing. You are shown the worn parts. I like the transparency. KNOWLEDGE OF TECHNICIANS, COURTESY AND ATTENTION TO DETAIL. I was in and out quickly and I was not pressured into buying anything I didn't want at the time. Staff is friendly, fast, knowledgeable and professional. When you pull in the employees are on the spot. You don’t have to leave your car. They are very friendly and quick. Can’t ask for more. Nothing specific, just “little” things. The only reason I was not highly satisfied was that my boyfriend had just left town for work and could not install the battery himself so I want to paying a little bit more, however, anytime I need anything for my car I always go to this Valvoline there is one of the workers there I believe his name is Miguel and he almost always works on my car he seems very thorough trustworthy and knowledgeable! I am glad they are here when I have a problem and have no one else to look at it! And I always use them for my oil changes! Cheaper And easier than doing them yourself! I was Highly impressed with the professionalism and service of all employees at the location. I feel that the prices are a bit high in comparison to competitors, and I would like to see a carwash included into your locations. I am a returning customer and appreciate the fast and courteous oil change service that I received on my visits. The staff make good maintenance suggestions and do not push for nonsense upgrades like some other service stations. The only reason I had to wait, they were busy. But the service is always great, well worth the wait!!! Great people and shop to visit!! I was asked to exit my vehicle while the fuel injector service was performed. I would prefer to exit my vehicle for the entire service regardless of what is being performed. Also, Jiffy Lube used to vacuum the car while the customer was out of the car. I miss that extra small service and being out of the way in the waiting room. Second, I think the service and all offerings are over priced. It is a high price to pay for the “no appointment” convince. Nothing much to say. Did what I expected them to do quickly and correctly. Knowable staff, who were friendly and very efficient! Thanks! The staff was very courteous, professional and efficient. I have 4 cars and will have all of my cars service there. The experience is second to none and the team in Mt. Pocono is world-class! Great staff, friendly and knowledgeable. Did not push services and did great work. I will not grant a perfect score because no one is perfect. Respect is primary, all staff displayed respect and were not pushy. Knowledgeable, experienced and very Customer Service friendly. As long as this keeps up I will continue to take my car there. The service was great . Them made it really easy for me to understand what I needed done and the price was great. I like the transparency of the business model. Second time having service there and I was in and out in under 10 minutes. No problems or issues and had services recommended that I will come back to have done. Courteous, fast & complete service! Love the service and the people that work at the Mt. Pocono, PA Valvoline. Always nice and friendly. Prompt, efficient, welcoming, affordable, competent, convenient, thorough. I go to the same location every time and always am very happy with the service. I have been in the automotive business for over 25yrs and never had an oil change done so quickly and efficiently. I was in and out on under 6 minutes and was very impressed with the professionalism of the valvoline staff. I am highly recommending this shop to my family/ friends/ co workers. All staff very focused and professional. The thorough explanation of what the job comprised. After talking to the service person decided to get the job done right then. Very quick service and they let u know anything to be concerned about . Not pushy to sell !! I had the girl and she was excellent. I forget her name.. sorry. She had no trouble getting Suzuki filter off which most all men do! Friendly service with great customer care and information about my car’s service needs. Knowledgeable and quick reliable service for my car’s better performance! I like that the wait wasn't long at all.It was a plus you were open on Sunday ,that was great,Shop very clean,and my service person Jessica was very professional. Will be back the next 3.000 miles very happy with the service and will recommend to others. Jessica was extremely knowledgeable and helped me understand what other services I should look into befor winter. She was very pleasant and nice! I pulled up and was taken care of immediately. Did not have to get out of my car. They were done in less than 15 minutes. Pleasant staff. Will continue to go there. I’ve been going to this location for sometime and at every time I always get top notch service from the staff “GREAT JOB” keep up the good work. Because I'm always taken care of in the manner that I like. Quick, ease of access and curtious staff. The technician was very knowledgeable when I asked questions. I was more satisfied on some other visits before this one.. There were times I got an oil change when I had 40%and the last time I came, I was told it's not needed until 15%. So I paid for many unneeded oil changesSometimes I feel they do try to get you to get things before they are needed. Pleasant and fast service ! The diligence of staff to do all checks, advise of everything done, reasonable recommendations, the showing me if item to be replaced as well as new item going in. The building of a trusting relationship. I really appreciate the care I get at Valvoline. From start to finish the staff was great!! The shop manager worked on my car. He could not be nicer or knowledgeable. The young man who rang me up was just as nice! Just a great shop!! The price for a full synthetic oil change is a little pricey. I would be more likely to visit every oil change if you offered free tire rotations. I alternate my visits between Valvoline & Kost because for the same price I get an tire rotation at the other shop. Fast paced operation. Impression of competence obvious. Serious but friendly staff. Customer service was excellent I’m not from this area, when I go back to Ohio I will definitely be using Valvoline near me for my future car needs. My husband will be bringing his as well. The price was very high, I should have went somewhere else. They didn’t show me my oil filter, so not sure they even changed it. They kept trying to sell me other services. I asked if they rotated tire and they said yes, just couldn’t lift my truck and do mine. Received instant service. The technician stood by the car and made sure I understood my options. He also made sure I was satisfied with the service and had no questions. Your staff was very courteous and knowledgeable. We had to go in at the end of their shift on a Sunday, it was an emergency our oil was at zero. They were able to quickly ascertain the issue was an the "oil plug' was not properly plugged in. They did not try to cheat us and were very honest. You should really commend the staff at this location. Couldn't ask for a more competent and professional staff. They are very thorough and I appreciate that they show me and explain what they are doing throughout the process. Great and fast service! Employees are very good! Pulled right in and service began straight away. All of the staff was friendly and knowledgable. The girl who did the majority of my service(aside from being under for the filter) was fantastic! A breath of freah air to have a fellow female in there. She was thrilled to hear i like cars also and really did a thorough job. I had a transmission flush and oil change. Several other cars finished their oil changes while i waited, but this was expected and i believe shows just how amazing and fine tuned your oil change process is. Refined is the word that comes to mind. I will honestly never go elsewhere! I believe 40 dollars for a oil change is to much. It was okay. Nothing special happened and nothing really bad happened. The team at Valvoline in mount pocono PA are amazing. They are always on top of their game. Friendly and excellent customer service. They tell me exactly what I need and how much it will cost. The mechanics were knowledge, friendly, and provided thorough and complete explanations; no pressure to do any additional maintenance other than the oil change. Also, because my oil efficiency level was at 4% and I was more than 100 miles away from home, and it was a Sunday, I was extremely satisfied with the service. My only criticism is that the cost of $97.00 was approximately $40.00 more than what I normally pay for synthetic oil when I have the oil changed locally, however, when I have my oil changed locally, I have leave the car at the facility usually for 3 or 4 hours. I was in and out in under 15 minutes . Terrific experience. Very good efficient service even had Toyota part I needed on hand. I am a mechanic with a good understanding of auto repairs so it's always an advantage I keep under my hat and see how I'm treated... good job! The staff was phenomenal but the price was too much. The customer service was excellent and used my coupon for a discounted rate. The only problem I had (and it was no fault of Valvoline) was the delay caused by a power outage. Professional Staff and service was fast, correct and on point. The associates were friendly, explained everything they were doing and why, but I appreciate them showing me my oil on dipstick to show that the oil was in engine. Because its quick, they keep record of your previous visits and very knowledgeable. I was given a 20% off coupon, and was unable to use it at my location. Why would you even send me a coupon for a far away location? You know which location I go to and should not be sending me coupons for locations that are not relevant. I wish I would have known that because now I didn't have time to find another coupon and I am out the money. I feel like it was a bit expensive. Anyone can get the same Valvoline 5 quart size container of oil and filter from Walmart for $35-$40 and I was charged almost $100. I’ll probably be changing my own oil from now on for half the money. I appreciated not having to leave my car and the quickness of the oil change. The staff members who worked on my car were kind and courteous! They were professional and explained to me things that were wrong with my car with no pressure to buy anything extra especially being a single mom on a budget! Friendly knowledgeable staff made me feel welcome and took care of all my service needs. I always come to the valvoline station in mt Pocono never any problems in and out. I noticed on my receipt afterwards that when it came to the grease fittings that it states all were sealed. This is not the case, these trucks have 11 so I believe that none of them were greased which is a part of the service I paid for and did not receive. After looking under my truck I can confirm that not one was greased at all. I generally do routine service is on my vehicles myself and on this particular day I do not feel like doing it so that is why I brought it to you guys. It's always a great experience at the Mt. Pocono Valvoline Instant Oil Change. Quick and quality service, great recommendations on services I should consider without being pushy. Miguel was an amazing manager! All of my questions were answered. The staff is very knowledgeable and friendly! Thanks a bunch! The guys got me in and out in about 15 minutes. Very professional and friendly I go to this Valvoline every time for both of my cars. They were all working efficiently & quickly!Also very polite, & friendly too! My questioned were answered . I believe the staff is knowledgeable . The service was quick but very detailed . Staff was courteous and efficient. Very happy with amount of time it took to complete. First time there, service very professional and courteous. Tech Jessica was awesome! Explained everything. Felt comfortable. Definitely will be returning. Brian was courteous, welcoming, efficient, communicative and caring. I felt that my needs were of importance. I trusted his opinions and valued his advice. I have been thrilled with the service I have received at this location each of the many times that I have visited. I frequently share my opinion about this location online on local Facegroups and in-person to friends and encourage them to go there. The location is immaculate and everyone I have ever dealt with there has been impressive. I leace feeling confident that the service that I received was thorough and effective and that the technicians were knowledgeable and ethical. All ways same employees there .. When u see new faces all the time at places is not a good thing... Always in an out .. and feel comfortable with there work that I don't have the urge to recheck their work. In & out. Friendly staff. have had many oil changes there. I like the professionalism of the staff. I like how quickly everything gets done. I came prepared for a long dull wait in the waiting room. I never had to leave my vehicle. I was in, out, and done in no time at all. The technicians were extremely friendly and and knew exactly what they were doing. Everything was explained to me in detail and I was shown the air filter and oil dip stick to make sure everything was ok with me.. I was not kept in the dark like most places do. They checked my rear differential fluid and suggested I have it changed, and left it up to me whether to do so. I agreed and I am so happy they checked this, as it really needed to be changed. I truly will recommend Valvoline to anyone and will go there again and again..Thank you for being so courteous and efficient. Wiper needed to be replaced. Technician first checked to see if he could repair then explained why it broke... I have a crack in my windshield. He then put a smaller one on so it wouldn’t get caught and break again. This where we get our oil change all the time. Jessica was honest fast and thorough. She explained to me each thing she did and the reason why I needed a new oil filter. I was very happy with my visit. I felt the services were over priced. I could get the same service at Jack Williams for 15-20 dollars less. they tried to sell me something i did not want to buy. Service was very fast and thorough. The staff member who provided the service was extremely good (can not recall his name). While I was there I experienced numerous attempts to get me to buy other things for my car. I understand that they have a job to do and I can respect that but the constant questioning and the constant sales pitches that I got was not necessary. I came for an oil change if I needed anything other than that I’m fully capable of asking for it myself. In right away and the technicians were speedy and they were helpful. In and out in 15 minutes. What a first time experience, I didn't have to leave my car and they got me in and out in minutes. Thanks guys! I requested conventional oil which is what I've always gotten but now I was told they couldn't give me that oil and that I had to upgrade to the synthetic oil. I only wanted an oil change not a diagnostic evaluation of my car. Was charged $79.00 for a full synthetic oil change with AAA discount. In the past (one month ago) paid $55.00 for exact same service. Technician could not explain to me why it was over $20.00 more this visit one month later. Oil change was such a quick experience. I barely finished checking my email when the mechanic finished. The staff was very quick, courteous, and through. Everyone that I interacted with was polite and knowledgeable. Service always quick when I pull in. They always look at prior services to see what I already had and don't pressure me about extra's. It's always my decision to get any extra services. Very pleased with the service I have received. Its a bit costly. They charge to top off fluids. I was in need of an oil change but with my work schedule and my hours no one is ever open and i have to make appointments and it will be awhile and so i just put it off. I couldn’t do it myself because it’s winter and there was a foot of snow around my car. I googled oil changes saw that valvoline has a drive thru 15 minute service with other inspections so i managed to go before work it took about 16 mins from the point of pulling in to driving out. The actual service was probably under 15 minutes but i had to make choices and had questions. I will go back for my next oil change and have my tires rotated and air filter changed. I’ve been coming to get the oil change for many years here and always a great experience. Quick friendly service. And relatively cheap. Also I got to relax in my car and indoors during the entire service. our tech was knowledgeable about other services I asked about and the crew got us done quickly. I am a frequent user of this drive through and I recommend them to my friends. The guys were attentive and very good at their job. They did not presure me inti anything extra or to go inside to the waiting room. They were very kind. I did not feel pressured to buy anything I didn't want. The young man processing my order answered all my questions. I liked that several people worked on my car...sort of felt like I was at the pit-stop in a raceway. The service is expensive but because they check so much: tires, fluids, etc., i feel like it's worth it, especially in winter. I'm an older person so it helps me to have all these things checked. The Tech was professional and I enjoyed watching him perform his work. Thank you. Jessica was great, rest of staff very friendly, I like Valvoline products so I will be taking most of my cars to this location. Staff was very courteous and efficient. Everything was done with professional expertise. The oil change was done while I sat in my vehicle without having to wait in a waiting room for a long time as they do in many places. I really love that it’s fast and convenient and you don’t have to leave your vehicle. In my opinion a oil change should be no more than 30 dollars tops. I love the service but don't love the price! I was told what I needed...they had my info from my previous visits.My van is running better since being serviced.I specifically told them that I would he recommending them to others. Let me tell ya, you corporate guys got it down. The 2 oil changes in 3 days were a pleasure. Nice staff. Hope your paying em what they are worth. I was upset that they didn’t have a machine to check my alternator. I thought they check the wiper fluid but didn’t cause I ran out after I left there. The crew explained everything thing that I needed for my car to function correctly and was very pleasant. Overall service was excellent. Not pressured to buy extra services. The mechanic was very friendly, efficient, and did not pressure me into any additional sales. Quick and customer service was great. I reside in New Jersey but was visiting family in the Poconos. I knew I needed an Oil change and decided to have it done there. Please note: I did say that it would be highly unlikely that I would return to "that site", however, I will look into using a Valvoline station where I live. They were quick, polite, professional, etc. No reason. I was happy with service. Always get the job done in a timely manner. This was my first visit as Valvoline. I especially liked the fact that I did not need to get out of my car...modern technology, love it. I was just amazed at how thorough and fast the oil change was done, along with checking minor maintenance as well, tire pressure, fluid levels, air filter and such. Will definitely return. The services were up to standard, fast and with reasonable pricing. I have a few comments. I googled your price online it stated $59. For dextro blend. Immediately you charged me for 1 additional quart of oil. Why didn’t you ask me if I wanted to pay the additional money or explain in advance of the service that there maybe an addition charge. No the oil was added and I was informed at the end of the service that the price was 69. I also considered using a Groupon offer but I was told you couldn’t purchase it and use it the same day. Fine but their price was $39. 35% off. Would you have charged me for the extra quart of oil? Doubt it! Thank goodness I went on line and had a $10 off coupon. The staff were great, quick, answered my questions. I had 5 toddlers in the car with me and the staff dealt with that really well! Brian and his team are very professional and friendly. His team is awesome. The young lady that took care of me, Jessica, was extremely pleasant. Its millenial quick! Glad to see females are being hired!!! The service was fast, professional, and courteous. It takes alot to get such a high rating from me. The service from to finish was excellent! Service was good, attendants were thorough and polite. I do have one problem though- when I asked the attendant what type of life I can expect from the synthetic blend oil change service he stated 5000 miles. Honestly I think that is a bit on the low end, from my research it can be has high as 7500 miles. But what really bothers me is the sticker that was put in my car recommends that my next oil change take place in 3000 miles. In my opinion that is falsely representing the product in an attempt to get me to change my oil sooner than it needs to be. I've noticed this before when I've had my oil changed at Valvoline centers and I think it's a policy you should review. Despite my overall satisfaction with the service I received I do not like the attempt at deception and will therefore take my business elsewhere in the future. Oil change was overdue and I did not have time to go to regular mechanic. Have used place like this in past and found it to be high pressure to buy other things but did not find that to be the case this time. It was close by and convenient but a little pricey compared to my mechanic. Was willing to pay for the convenience. Because I don't have to get out my car, and it's done in a a very short time. Staff was knownlegeable and courteous. Service was fast. Fast service for a task I have always dreaded! I will always go to Valvoline in Mount Pocono for my oil changes. First of all been a customer there 14years brain the Mgr is one reason been coming back and Also miguel a Tec he expain step by step and also go beyond the leave love that kind of service !!! Keep up the good work !!!!!!! Quick service and knowledgeable staff. They even let some air out of a tire that was inflated a little more than the others. Expensive compared to other companies. You don't provide vacuum service. Friendly Staff, and very fast service. I hate doing oil changes because it usually takes a lot of my time. But this location was very fast. They did my oil change extremely fast... They also fixed my front light which was out. And being my coupon had expired they did give me $8 off my bill. Quick and easy. Answered any questions I had clearly and professionally. Staff is courteous and professional and do not pressure customer into other products. Very fast and efficient service. very friendly & quick. I was in and out within 10 minutes! The staff is courteous and I did not have to wait for my service. I was treated with respect and was presented with service options without feeling pressured into getting anything other than what I originally went in for. I had been in to a different location a few weeks prior and they didn't stock a bulb I needed. I bought one on my own and had trouble installing it. I asked the tech if he could replace the bulb I'd brought in and he did so with a smile. I appreciate that he was able to do that for me. Miguel was the one who took care of me. He was so nice and explained everything nicely and clearly. & he's cute!! I was in and out in 10 minutes. The staff is friendly and I trust that it is being done right. I have been here a few times and go there with both my cars. Because they resolve my problem and the staff are very polite today was my first time going to this location and i am very satisfied with there work. The staff was extremely helpful and understanding. They explained the "new chevy standard." Made it clear it was not necessary and changed it back to the maxlife I had been using.I actually had 2 staff members great me, since all the bays were full. And 1 apologized just before I was taken back, because the car in my bay was taking longer than expected to drive away after they were finished. Just due to how the process went it wasn't all the quick and plus the workers are all the experienced. I appreciate the transparency of the process, and the technical knowledge of the staff. I like the efficiency - I got an oil change and a coolant flush/replacement in half an hour or less - but also appreciate that the speed with which the services are performed doesn't compromise the quality or safety. I felt like I was being urged to replace an air filter that wasn't in my opinion dirty enough to warrant replacing just yet. No pressure was felt, however someone less knowledgable about cars may have been compelled to replace it simply by having it presented to them to inspect. Overall price was much higher than I expected . But the staff were wonderful ! I asked about possible problems with my van, somewhat unrelated to the oil change. The manager was able to give me possible scenarios of what the problem could be. Service mostly with a smile. The only one not smiling was the tech that handled my service but overall a great experience. Will do it again. It was very fast and convenient. All the employees I had contact with where very nice. But the price was a little high. First visit to this location. The staff was professional and Knowledgeable. asked ONLY for oil change and filter and as at everyone of these type businesses we had to go through the whole story. Air filter, wipers, lights, etc. No waiting, professional courteous service, and the attendants appeared to be knowledgeable and knew exactly what to do, quickly. They also had the history of my previous visits at their fingertips. The representative Aaron was very professional and knowledgeable about the services he provided. I wanted to tip him but he declined gracefully and pointed me to the survey. It was very pleasing to see the level of customer service returning to business via Valvoline. Thank you. Professional but personable. Service was quick but thorough. Pleasant experience. 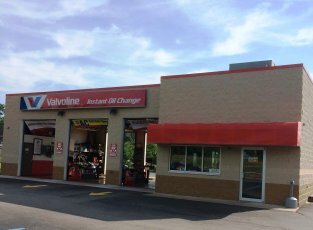 I have been to the Stroudsburg Valvoline several times and have had a good experience, but the staff at the Mt. Pocono location went above and beyond in providing exceptional service for my vehicle. The staff brought me in immediately upon my arrival and thouroughly explained the pricing and benifits of each oil/service. Often times I feel like I am being upsold, however, the staff let me chose the services I wanted based on their educatucated suggestions. It was incredibly helpful and allowed for a speedy fix for the many problems I was having with my car. The best part about the expirience was the staff I encountered! Valvoline is so lucky to have Brian, Mike, Jessica, and Shawn! They all went above and beyond and because of their incredible service I will be returning to this location for my next oil change. Thanks again! It was very fast, they were extremely professional and the prices are great!!! The service was quick and efficient. Staff were polite and didn't try to push other services or merchandise on me. Very prompt service and technician was very helpful. Any questions I had were answered. No time was wasted. Everything was done without any problem. The pricing for an oil change is quite high. I know you charged for service as well, but I see bottles of oil in gas stations for $10 or less. Asked to have them rotate my tires but said it didn't need it. Have put almost 10,000 miles on my car since I bought it and think the tires should have been rotated. I was very impressed with Jessica, I believe her name was, very professional, right on point while training another associate! Great person to have on your team! No problems at all with overall service as well as customer service.. pleased..
My only criticism is that I felt that the price was just a little high. very professional no selling me anything I didn't want. I accidentally pulled in front of this "drive thru" service and some employee came out and asked "what I needed." I responded by saying an oil change he told me to pull around back that it was a "drive thru." He seemed slightly annoyed and I could care less for his demeanor. Mind you it was pouring rain so having to take a step outside to tell me may have influenced this. Once inside though, Brian and Jessica made the rest of my 10 minute (possibly less) experience all worth it. Both extremely pleasant and professional they had my vehicle serviced and checked with no hiccups and me feeling fully confident in the steps and procedures. Great visit will tell others. I usually go to the Stroudsburg location, but I was in the Mt. Pocono area and decided to go there this time. I was pleasantly surprised to see a familiar face (I think Aaron is his name) from the Stroudsburg location. Miguel, Jessica, and Aaron were attentive and honest. What a great experience! Fast, efficient service and staff. The staff at the Valvoline mt Pocono are always nice and pleasant, and also quick. The customer service was great. Very polite and professional. Ive bin coming to valvoline for yearsale. Every since I lived in jersey. And now I moved up here I'm thankfull there is one here. I like the convince of the in and out while you sit in your car. I also like the free wifi avaliable while you wait it's the little things like that . One request is maybe start haveing complimentary coffee for customers in the waiting room. Have service techs give the costumer a choice whither they would like to sit in their car or in the waiting room . Was very quick and was a good positive experience. The attendant answered all my questions and he was sooooo sweet! Very prompt and professional even impressed my mom! I TRIED SEARS AUTO SERVICE BECAUSE IT WAS CHEAPER BUT THE LACK OF QAUILTY SERVICE BOUGHT ME BACK TO VALVOLINE. Tried to sell me oil additive that supposedly would lengthen life of the oil but when i asked if I still needed to change the oil in another 3000 miles he said yes. Well no brainer there if it will extend my oil why would I need to change it at the usual miles. Guess because I was female they thought I would have it done because they recommended. Not a dummy here. No waiting, courtesy was nice, they brought up previous serveses promptly, they reset my car Service Data promptly, they answer any question about vehicle or Transmission services on my other vehicles.. The staff is very thorough and very efficient in what they do. The Tech's at this location went above and beyond to ensure that my vehicle was taken care of...I've always enjoyed superior service here and will continue to be a customer no matter what vehicle I'm driving. overall my basic oil change took 35-40 min, with only 2 other cars there. This is the longest it has ever taken in my visits and it was not at all what i was expecting. I just thought $45 was too high for wipers. I much preferred Jiffy Lube. I don't like sitting in my car in the service bay. I had to exit my car for the tire rotation. Every customer should be directed to a waiting room with basic amenities until the work is completed. This is the reason I have not been using valvoline for my service. I have been using a local tire center. I only used valvoline today because the tire center is busy and I did not have time to wait. The tire center waiting room is busy <--take a hint. Timing of the visit was excellent, no waiting line, when I left there were cars entering the bays for service. The technicians were efficient and courteous. I wasn't dissatisfied. Due to the winter weather they bay doors remain closed which is understandable. I pulled up to the bay I waited maybe 1-2 minutes and was greeted and directed to pull into the bay area. Last time I got an oil change here it was 80 something dollars with an oil filter. This time it was $118. Felt as though I was interrupting the 2 person crew when I arrived. No checks done. No explanations of procedures. Just oil change, pay and please leave attitude.Been going for 3 years but may not return. Employees answered all of my questions to the best of their ability, service was quick and great, and everyone was friendly. Car runs better with the synthetic oil they recommended. Great customer service; wonderful staff; quick, easy, price was right! I had other business to attend to in Mt. Pocono and took my wife's vehicle to get oil change. Got Transmission done as well. It was making a noise and they explained it was the serpentine belt and went above and beyond to get one and install it all at a reasonable price. The Staff was efficient and friendly. Everyone involved was on point and curtious. It was quick and simple. Extremely convenient and enjoy using my coupons. 1. Almost out the wrong battery in my car, but luckily another employee caught it (no big deal, mistakes happen).2. Should have coupons in your system for returning customers especially to the same location (in case I delete email). Besides that not terrible service. This is a great professional, thorough service station. A great value. I drove 30 miles out of my way because I knew that Aaron, who serviced my car at another Valvoline had been transferred there. Because of him I will travel to this location for all my car's future needs. Valvoline was fast and made me feel comfortable able the service that was done to my car. Very polite and transparent customer service. Every step that the technician made, he communicated to me. Showing me the dipstick after the oil change was a great move to show the honestly in the service. First time getting service, and definitely will not be my last. Thank you. I went on Tuesday and wiper blades were bogo I went back on Thursday and the price changed. I gave a coupon but it was not deducted. When I got home I saw I was charged for a drain plug and gasket and no one mentioned that while I was there. Also the oil pan was completely replaced 3,000 miles ago so why would the plug need to be changed again? I feel taken advantage of.